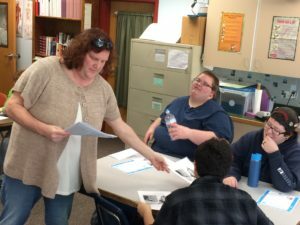 Phoenix health technology teacher Gabrielle Webster practices job interview questions with Bright Works Oregon students. The room went suddenly quiet during a February afternoon interview practice at Phoenix Charter School. The hush that followed was broken by students’ laughter, as Preslee explained she was imagining applying for a culinary job. “I need to think before I speak,” she said. Bright Works Oregon student Preslee Jaynes, right front, participates in a practice interview session with, from left, Danielle Teichner, Thomas Helwig and Ty O’Hara. Practicality is a big focus of the Bright Works Oregon club, hosted weekly by Phoenix since early January. Despite Preslee’s role-playing with food preparation, the program’s basic goal is to help students identify pathways to careers in the medical field. Sessions cover a variety of topics. Because it’s new at Phoenix, much of the curriculum is still unfolding. 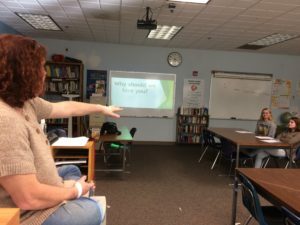 The Feb. 13 session covered the so-called soft skills critical to any career, primarily how to prepare for a job interview. However, health-related topics were on the agenda for other meetings, past and future. These included medical terminology, CPR training, nutrition, addictions counseling, organ donation and cultural competency (the ability to relate to patients of diverse cultural backgrounds). Anatomical equipment stands ready in the background of a recent Bright Works Oregon session. Outings were in the works to a dialysis center, the Umpqua Community College nursing program and Oregon Institute of Technology. Cow eyes and pig hearts and kidneys were on order for lessons in dissection. Not everybody would be excited about the prospect of digging into animal organs. But Roseburg’s Kylie Bleigh, 17, said she was looking forward to that exercise. She and fellow Roseburg High senior Jasmine Marin not only had signed up for Bright Works, but also shared a post-graduation destination. The two plan to attend OIT in the fall to major in pre-medical imaging technology. That kind of versatility is a hallmark of the career-connected learning offered by Bright Works Oregon. The program was introduced in Douglas County by the Area Health Education Center of Southwest Oregon. Organizers aspired to build a model that could be applied to other career areas. Since then, sponsorship of Bright Works Oregon has been transferred to Douglas County Partners for Student Success and the Umpqua Valley STEAM Hub, with funding from a recent Meyer Memorial Trust grant. The grant, made through Meyer’s Equitable Education portfolio, is intended to fund “a continuum of career preparation experiences to align priority youth in Douglas County with employer needs,” according to the award announcement. 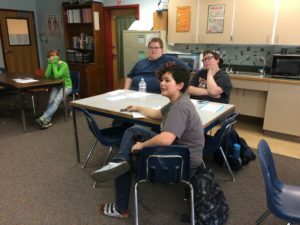 Phoenix is spearheading the first school-based Bright Works Oregon club in Douglas County, but others are in the works. Students in the group that started meeting in January are from Phoenix as well as Roseburg High, with some of them also already taking classes at UCC. One student enrolled at UCC is Phoenix senior Thomas Helwig. He said although he believes his calling is to work with Special Education students, he attends Bright Works to learn more about the medical field. As Thomas, Kylie, Preslee and the other students discussed skills needed in the medical field – social skills, compassion, a strong stomach, attention to detail – their teacher pointed out how they could highlight those attributes during job interviews. Webster also explained what can make a difference between two candidates. “Let’s say Jasmine and Kylie are equal in everything else, but Kylie has CPR certification and Jasmine does not. Kylie gets the job, right? Even one small thing counts,” Webster said. Instructor Gabrielle Webster hands out workshop information to students Thomas Helwig, clockwise from left, Ty O’Hara and Preslee Jaynes. More than one student expressed enthusiasm about upcoming sessions with hands-on activities, such as working on vital signs with UCC nursing students. 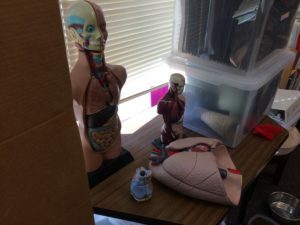 Webster said after the class that increasing her students’ knowledge of basic medical practices should help them as they schedule college classes. “Meeting with professionals in the field allows them insights into these professions, and they may discover something that they are passionate about,” she said. DCPSS will publish more information about future Bright Works Oregon clubs as they spread across Douglas County campuses.